Rumors swirled yesterday that Salesforce, the $40B SaaS behemoth, had been approached by an acquirer. Dan Primack speculated this morning that Oracle and Microsoft are the likely candidates. 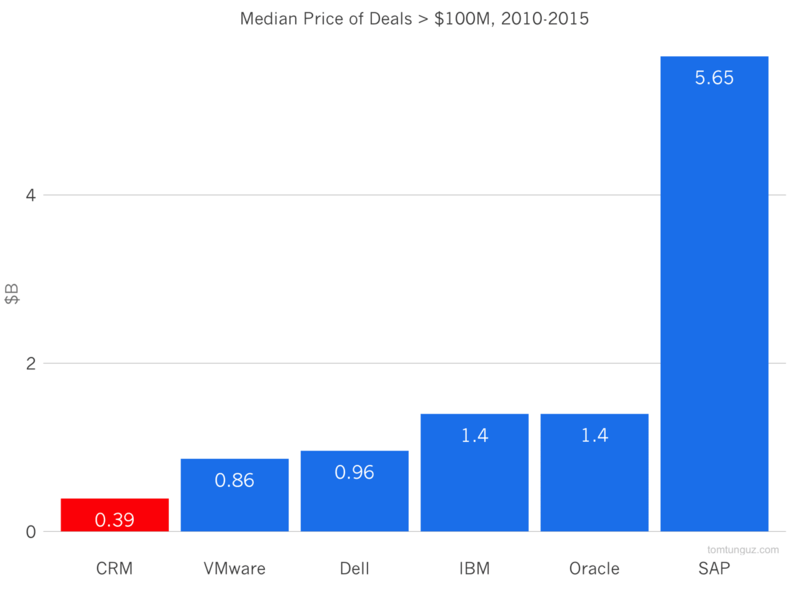 If Salesforce were to be acquired, the SaaS ecosystem would change substantially. 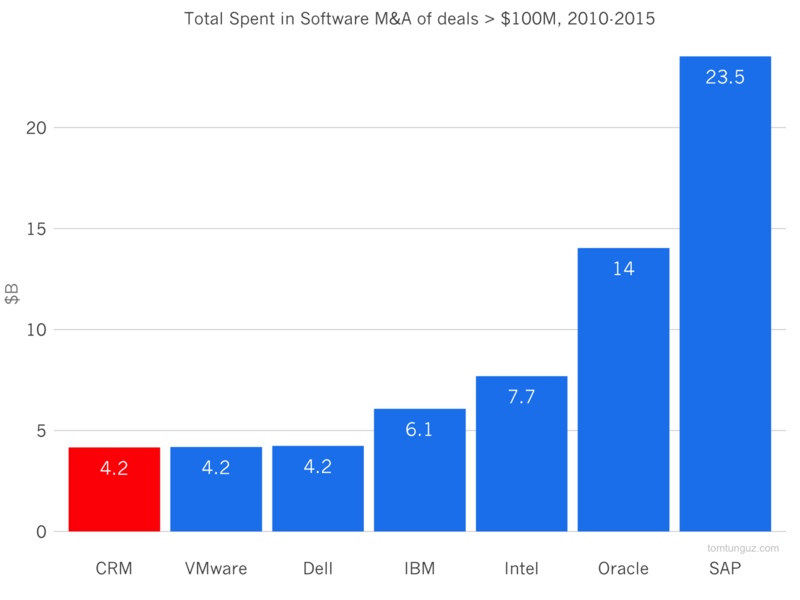 Looking at the market caps and the balance sheets of the major enterprise acquirers, Microsoft could certainly acquire Salesforce outright in cash. Oracle would likely acquire the business in a cash & stock transaction. Most importantly, the number of large market cap companies capable of acquiring substantial SaaS startups would decline. In the past ten years, Salesforce has been the second most active acquirer of next-generation enterprise companies at greater than $100M, tied with IBM and second to Oracle. Salesforce acquires more frequently than most others, but their median purchase is smaller, about $400M compared to roughly $1B for the others. SAP is an outlier because of their Concur, SuccessFactors and Sybase acquisitions. 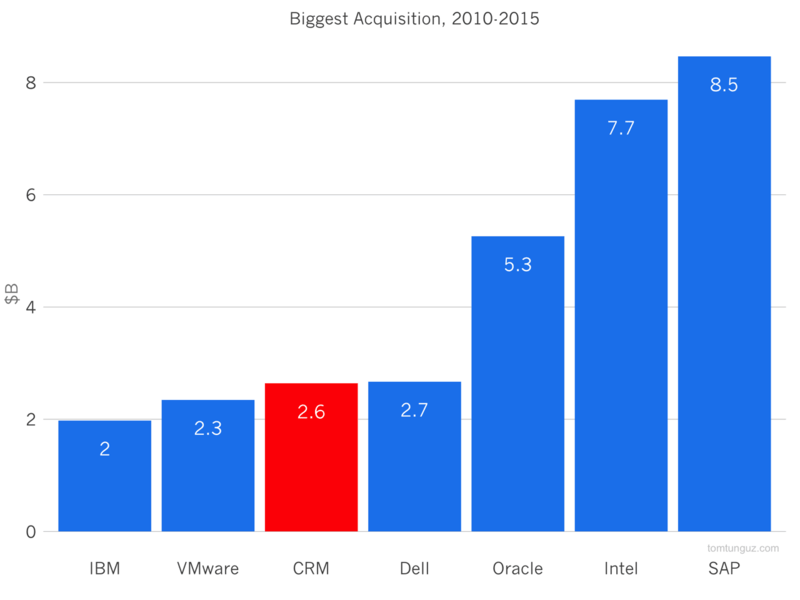 In terms of total transaction value, Salesforce has spent $4.2B in the past five years in acquisitions greater than $100M, tied with Dell and VMWare. Microsoft didn’t make the list because they’ve spent about $1.5B in the last five years on Yammer, Acompli and Sunrise. Salesforce is squarely in the middle of the pack when it comes to very large acquisitions, in this case ExactTarget at $2.6B. 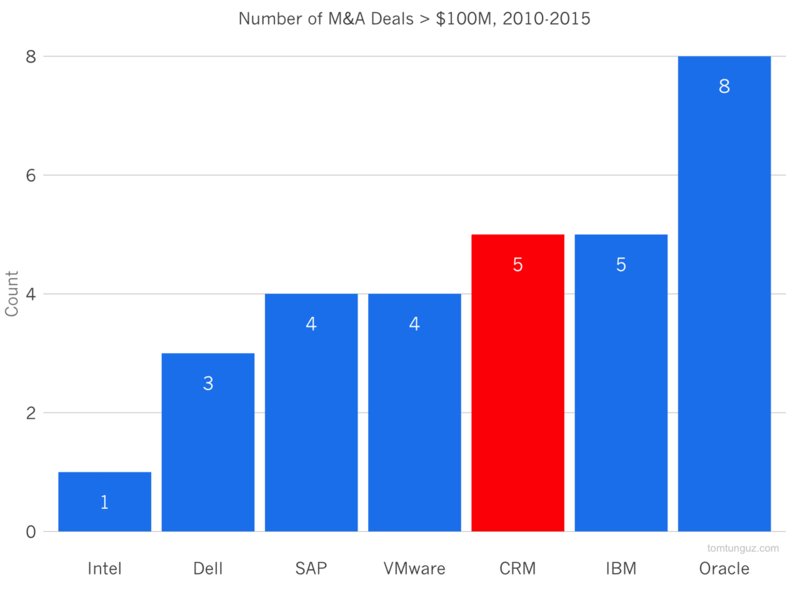 If Salesforce were to sell, the M&A landscape in the startup ecosystem would lose an active acquirer.